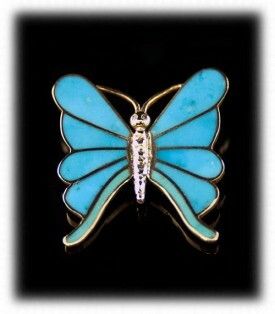 Durango Silver Company specializes in Custom Turquoise Jewelry which is handmade in the United States of America. 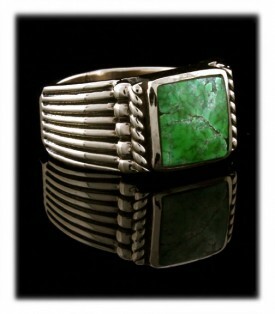 There is nothing that compares to high end Turquoise jewelry wether it be made in Sterling Silver or in gold jewelry. What makes it even more of an heirloom is when it was custom made by a top level American Jewelry artist. Every piece of Turquoise Jewelry in our collection is custom made to accent the top gem gradeTurquoise cabochon. Custom Turquoise Jewelry is the perfect gift for any occasion. When you look through our catalog you will find that every piece is different and almost every gemstone has it's own identity. Mark a milestone with a custom Turquoise necklace, or choose custom Turquoise earrings with her favoite variety of American Turquoise for a thoughtful birthday gift. Custom jewelry design achieves the perfect balance of elegance and originality. Glorify yourself with custom jewelry made especially for you. Here at Durango Silver Company we will also take on Semi-Custom Order jewelry. You contact us to make a design simular to our past creations, or our current creations in your size and with the type of Turquoise you would like, providing we have that Turquoise in stock. We will always take a look at what you want and try to make it happen for you. Custom Turquoise Jewelry.Unique, handcrafted, Custom Turquoise Jewelry from American Jewelers gives you the pleasure of creating and owning a singular piece of jewelry that will become a part of you and your family. Our craftsmen give you the opportunity to bring your touch to our classic designs by choosing your one of a kind stone.. Not only will yourjewelry be a unique representation of you, it will fit you like a glove, and it will also give you an heirloom quality creation of art that you will be proud to pass down through the generations of your family. Custom Turquoise Jewelry comes in many levels and prices ranges. From the most common jewelry made using our designs to lost wax castings, to the high end hand fabricated jewelry in 14k Gold. We only take on totally Custom Turquoise Jewelry projects when they are going to be museum quality and merit our utmost attention. Having said that, we will always be glad to make you one of our creations tailored to your size and stone preference. We have almost every kind of Turquoise, or variety of Turquoise known to man. We can also make custom silver jewelry and custom gold jewelry in many gemstones other then Turquoise. Here at Durango Silver Company our craftsmen are capable of providing you with the unique handcrafted jewelry that you desire at the same price we would sell it for if it was our own. 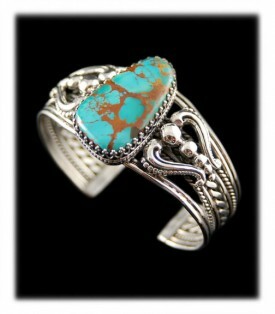 We do not charge a higher price for custom Turquoise Jewelry. We can create a new piece of jewelry using your Turquoise, or other gemstones, or we can provide gemstones and Natural American Turquoise for you using our long standing relationships with some of the best stone cutters in the world. Not to mention we cut most of the gemstones and real Turquoise in our silver jewelry and gold jewelry. We can also take your old, rarely worn jewelry, and use it to create a new piece of jewelry that you will be proud to wear every day. What is important to us is not where your gems come from, but where your inspiration to create a beautiful piece of custom gold or silver jewelry that shows off your personality comes from. Our job is to make you a handmade jewelry work of art of top quality that will become a family heirloom for many generations to come. Durango Silver Company is known world wide for our knowledge of Natural American Turquoise as well as Turquoise from around the world. 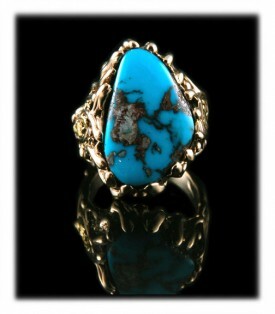 We are refered by many as the source for information and knowledge about natural Turquoise. Our American Jewelry artists are reknown world wide and have been featured in many prestigious magazines, books and articles. We have over 40 years experience in making high end custom Turquoise jewelry. When you need that special piece of handmade jewelry that you will cherish the rest of your life and pass down for generations to come, contact us. We will make you something that you will be proud of and will be the talk of all the parties and functions you attend. Learn more about Custom Turquoise Jewelry and Natural Turquoise Jewelry Jewelry by following the links in our Learning Center to other informational pages that we have written on different topics related to Custom Turquoise Jewelry. In addition, we would like to invite you to join our E-Mail Newsletter - about once every other month we send out a Newsletter to inform our members of what's happening with Durango Silver Company, new products, specials for our members and more. We also have a monthly drawing from our member base to give away free Turquoise Jewelry from our company. Please take a moment to become one of our friends by signing in below. We hope you have enjoyed this information page on Custom Turquoise Jewelry and you think of Durango Silver Company when you want to buy a beautiful piece of natural authentic American Turquoise Jewelry.